It doesn't get much better than this watch. I fell head over heels for it when I previewed it earlier this year. I know what you're saying, "it's a 'Paul Newman' Daytona, what's not to love?" That may be true, but then again, all Paul Newmans are not created equal. A watch of this magnitude is scrutinized up and down, inside and out - six ways to Sunday - before being added to someone's collection. Needless to say this watch is fresh to market. And that marketplace, I'm proud to say, is my very own backyard - Chicago, IL - where on the evening of Tuesday, April 25th, it'll be up for grabs at Leslie Hindman Auctioneers. 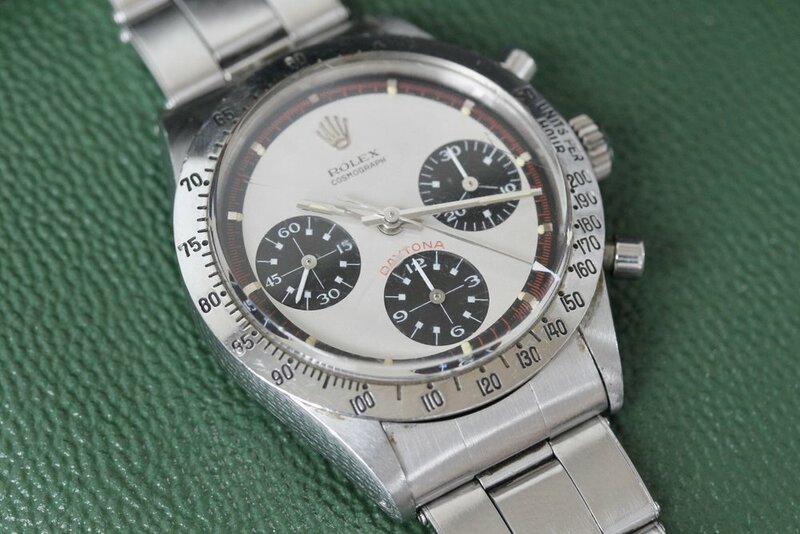 I think it's safe to assume collecting Rolex watches wasn't really a thing forty-plus years ago. I'm sure there were a few contemporaries of Mr. John Goldberger out there (with the taste and foresight to collect), but most of the sport watches we fawn over today were bought for their utility - not their collectibility. 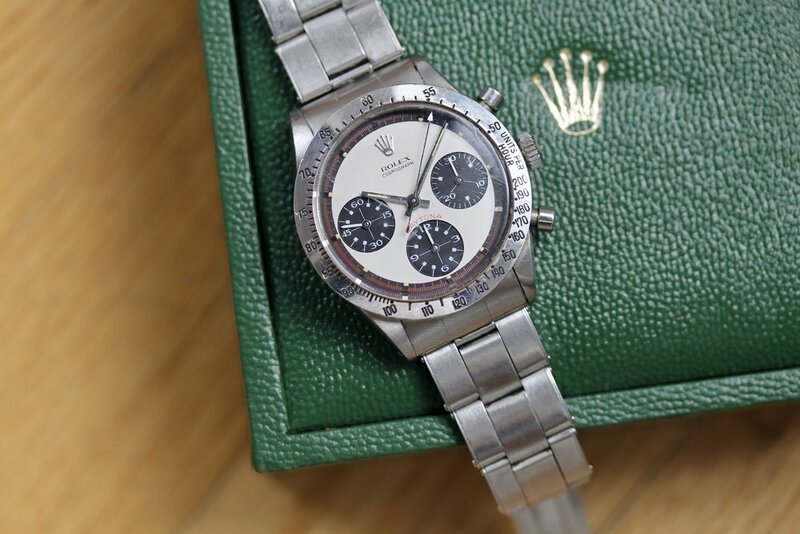 Watches like a Rolex Daytona were marketed as indispensable to professionals because of their durability and functionality - like having an Oyster case and built-in stopwatch. If you actually read the fine print of an old Rolex brochure, models such as this Cosmograph targeted "pilots, navigators or passengers of a small plane... [to] check ground speed and wind speed." Case in point is this exotic, "Panda dial" Paul Newman. It was purchased shortly after the current, original-owner graduated from flight school. I don't know what capacity it was used (perhaps just to record takeoff and landing times in his logbook). What I do know is this particular Newman Daytona enjoyed an early retirement. 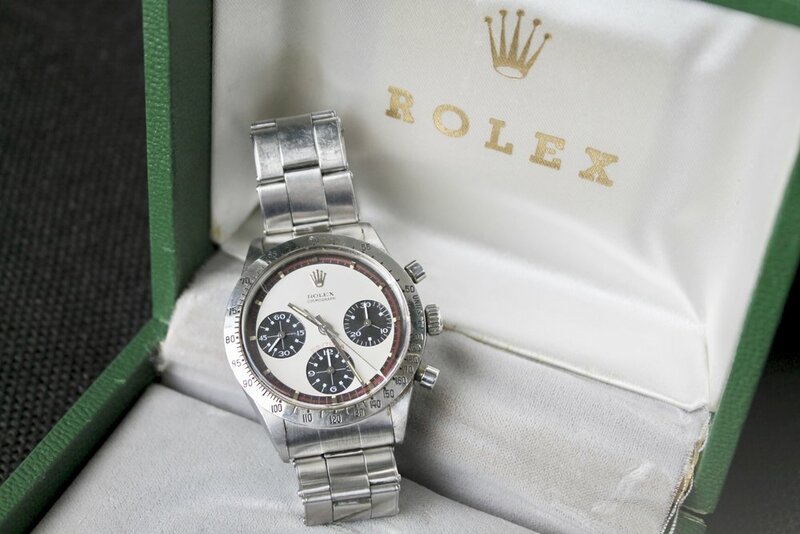 I found out from Alex Eblen, Director of Fine Jewelry and Timepieces, and James Wallace, Associate Specialist in the department, that the owner stopped wearing it after a couple years because "it didn't fit his lifestyle - [he thought] it was too expensive, too precious." He replaced it with a Seiko. Even through my amateur lens you won't find much in the way of a flaw. I've held the watch, I've tried it on, I've louped it, I've flexed the expandable links of its riveted oyster bracelet... 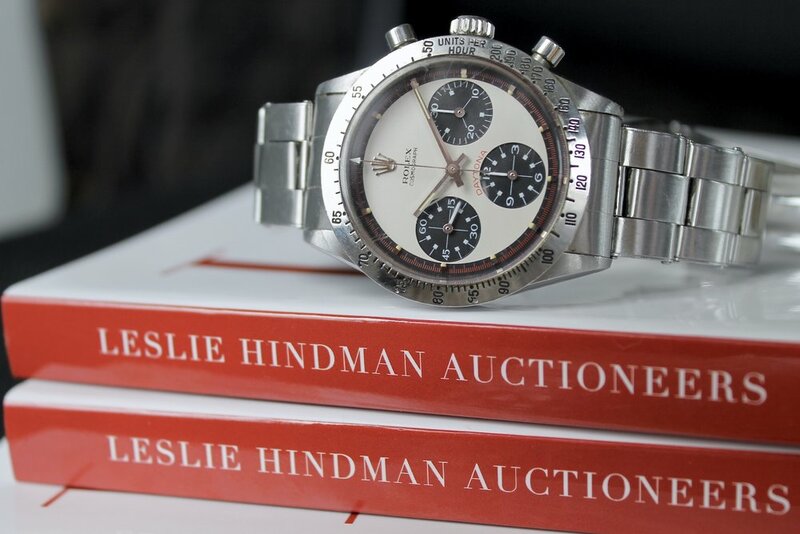 I'll say this to the future winning bidder: Just dab some polyWatch on the crystal and wipe down the case and you've got yourself one of the best Paul Newmans on the planet. To make it more presentable for gifting, he brought it to a local jeweler for a cleaning. (Yes I too cringed at the thought of a what a "cleaning" would entail...) Crossing the threshold of the jewelry store, the owner didn't know the significance of his Rolex timepiece, but you can bet the jeweler had an idea... Just as you'd expect, he immediately made an offer to buy the watch on the spot. However much the jeweler offered, it must've tipped the owner off because he politely declined and reconsidered leaving his watch behind. In that moment he thought it more prudent to conduct some due diligence before making another move.